3M™ 8200 Particle Respirator | U.S. Plastic Corp. This economical disposable N95 particulate respirator is designed to help provide reliable worker respiratory protection against certain non-oil based particles. 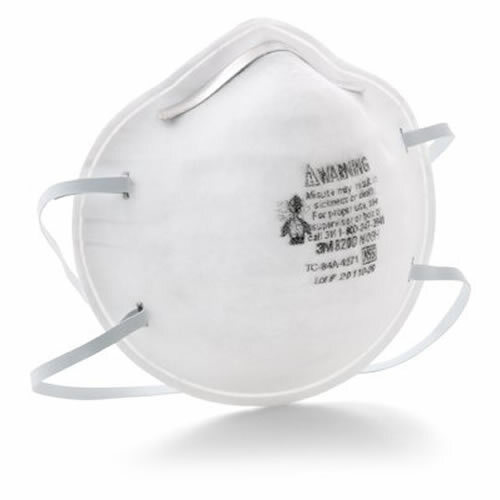 3M™ Particulate Respirator 8200, N95 is an economical, disposable particulate respirator that is designed to help provide reliable respiratory protection of at least 95 percent filtration efficiency against certain non-oil based particles. This respirator is designed for use for particles such as those from grinding, sanding, sweeping, sawing, bagging, or processing minerals, coal, iron ore, flour, metal, wood, pollen, and certain other substances. It may also be used for liquid or non-oil based particles from sprays that do not emit oil aerosols or vapors. This respirator can also help reduce inhalation exposures to certain airborne biological particles (examples: mold, Bacillus anthracis, Mycobacterium tuberculosis), but cannot eliminate the risk of contracting infection, illness, or disease.